Categorized as : Gluten Free RECIPES, Home, Mexican, Soup, What's For Lunch? This is inspired by the Albondiga soup of my childhood. This is not an authentic Albondiga soup, but it has some of the essentials in Mexican cooking, like cumin and cilantro. Garlic would also be a nice addition. If you are a Foodie chances are that you enjoy cooking by inspiration. If you are like us, you probably use your cookbooks more for inspiration rather than following a recipe exactly. This recipe was cut and pasted from a recipe adventure my family went on some time ago. Use it to inspire your next savory sensation. If you would like take a short cut use organic chicken or beef broth. 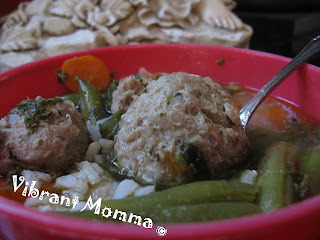 I started this Albondiga (Meatball) stew around 8:30AM, so that it would be done in time for a late lunch. Sorry this was a while ago and I didn’t notate the amount of vegetables to put in, but that is ok because this is a very forgiving recipe. Use whatever veggies you have on hand, corn would be nice. I rolled the balls, actually my daughter did, and dropped them into the stew and we simmered until lunch time about 1pm. I used some leftover plain rice from the day before and I combined it with the stew just before serving. I did this for two reasons: My son can’t eat rice and because it saves the integrity of the stew from getting mushy.